These are one of my favourite biscuits i used to have when i was a kid. We used to get in Bakery and irani hotels back in hyderabad. I love to have these biscuits dipping in coffee. They taste yummy....... 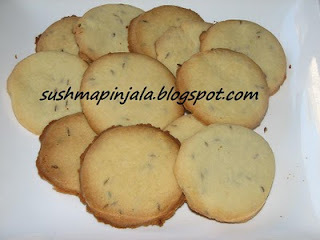 Here goes the salt and jeera biscuits, bakery style. Beat butter in 1 sp of sugar. Beat egg and add 1/2 of it to the above butter mixture. Add salt and jeera too to the above. Mix well and add baking powder and maida also. Make it to smooth dough and store in fridge for 30mits. With a rolling pin make as chapati ot tortila. It should be of 1/8 of an inch. Use cookie cutter to cut them to the shapes of ur choice. And place them one by one on the baking tray. Bake them on preheated oven on 180 degrees for 20 to 25 mits. Thats it u are done. Yummy cookies are ready to serve. Remove skin and wash chicken throughly. Once oil is hot add curry leaves, lengthwise cut onions and green chillies. Cook till raw smell dissappears. Now add chicken and mix well. Put the lid and cook for 5 mits on high flame. Now add salt, haldi, cumin, coriender powder and Garam masala. Mix well and put back lid and cook for 15 mits on medium flame. 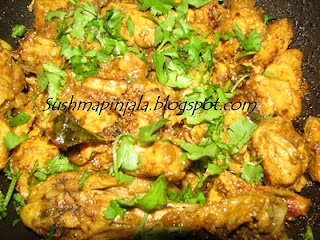 Need not add water as chicken looses lots of water which is sufficient to cook. Remove lid and mix once again and add pepper powder and cilantro. This can be had as a side dish or as an appetizer. Cook rice as usual and keep aside. Heat pan add 1 spoon oil and add washed and cut palak,cilantro and green chillies. Cook till the water evaporates which comes for the veggies. Cool and grind it to paste. Heat the rest of the oil in the same pan and add lengthwise cut onions and whole garam masala and curry leaves. Spices can be adjusted according to kids taste. Cook till onions turn golden brown and add the palak paste. Cook till oil looses and add rice and salt. Mix well and let it rest for 2 mits and switch off the flame. I have served this with boiled eggs. This is a very good way to feed kids who does not like spinach having it in different ways like dal, etc. This way it would be colorful and easy to feed kids. 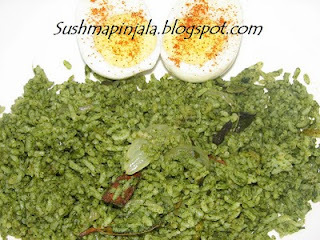 As a kid i liked this palak rice a lot. Wash the chicken keema throughly and squeese excess water. Now add egg, oats, chillies, onion, cilantro, haldi , salt and garam masala. Mix well and put itin fridge for 1hr. 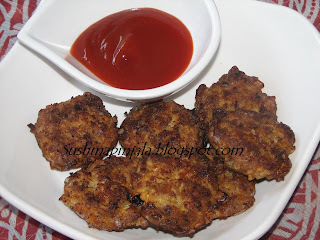 Remove and make as small patties or cutlets which ever shape u want it to be. Preheat oven on 250 for 10mits . Grease the oven tray and place all the cutlets side by side. Popit up in oven and increase the oven temperature to 350 degrees. Turn the cutlets to another side to cook after 15 mits. Cook on the other side for 10mits and remove. Do not over cook or bake them, they tend to become hard. Thats it remove and serve hot with any sauce or chutney. Boil potatos and peel skin. Make a paste of ginger garlic and green chillies together. Do not add water to make paste. This paste should be freshly made. Heat oil add mustard seeds,cumin seeds, red chillies, curry leaves and chana dal. Now add boiled potatoes cut into bite size pieces. Add haldi and salt. Cook on medium flame for 10 to 15 mits. Keep stiring in between. Now add ginger garlic and chilli paste. Mix well and cook for another 10mits and garnish with chopped cilantro. Having this with hot rice gives u actual flavour of ginger garlic and chilli paste. 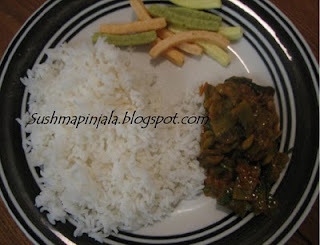 Good combination for sambar rice. Add haldi, corn flour, onion, green chillies, ginger garlic paste, garam masala, salt and cilantro. Mix well as store in fridge for 1hr. Pre heat oven on 250 degrees for 5 mits. 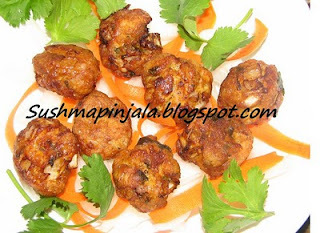 Make small balls or as per ur wish with the marinated keema and place them on the oven safe tray. Now bake them for 10 mits and remove. Heat oil in a pan and deep fry the baked pakodas. We can directly deep fry the pakodas but when we do that they tend to break easily and all the masala spreads over and spoil the oil. So when u bake and fry it does not take much time to cook in oil and also consumes less oil. Serve hot withas it is or with any chutney. This is very simple and healthy breakfast. In a pan add oats and water. On low flame bring it to boil. When oats are cooked and soften remove from flame. 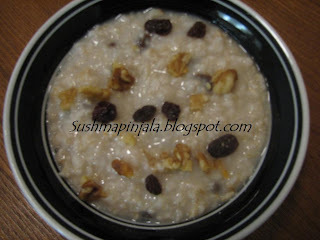 Serve hot with raisins, walnuts or any other dry fruits of ur choice. 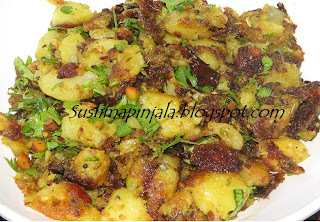 Soak chana over night and presser cook along with potato. Heat pan and add oil, add onion chopped, green chillies and tomato pieces. cook for some time and add potato. Mash the potato and add chana. Now add salt, chaat masala, garam masala and chilli powder. Mix well and add some water. 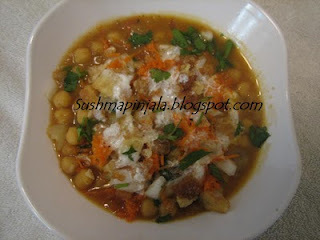 Garnish with onions, cilantro, grated carrot and crushed pani poori/golgappa. 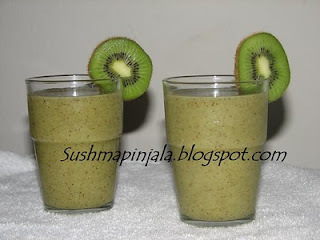 Its summer time and am here with a tasty and yummy KIWI and APPLE milkshake. Its simple to make and healthy too. Peel the skin of kiwi and apple. Cut to pieces and blend in a mixer or blender with milk and ice. Add ice and sugar while blending. It would be good if u do not add sugar to this milkshake, but if u are having this for 1st time u might not like to have it without sugar. Wash mango and dry it with clean cloth. Cut into small pieces and transfer to clean and dry vessel. Add methi powder,mustard powder, chilli powder and salt. Chop garlic to small pieces and add to the mixture. Now add oil and see that add the mango pieces are fully covered with oil. Oil has to float atleast 1/2 inch above the mango pieces. Mix well and keep it to a clean place where no one touches the box for 3 days. 3 rd day remove and lid and mix well again. Add salt or oil if required. This is the process for the mango pickle made for the whole year during the summers. As my hubby does not like pickles, i made very little quantity for myself. 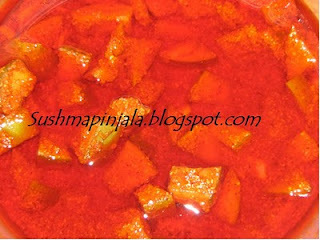 I love to have this pickle with hot rice. Chikudukai/ broad beans/surti papdi 2 cupsOnions chopped 1 cupTomato chopped 1 cupGinger garlic paste 1spGreen chillies 2Chilli powder 1spHaldi pinchSalt to tasteOil 3 spsCilantro chopped 1/2 cupMethod:Heat pan and add oil.When oil is hot add chopped onions, green chillies, salt and haldi.Saute for few mits and add ginger garlic paste.When raw smell dissappears add tomato and chilli powder.Now cook till tomatoes are soften and mashed up.Add chopped chikudukai pieces and mix well. Put on lid and cook on low flame.Add some water if needed.Garnish with cilantro and serve.I have served this curry with rice and some veggie sticks on the side to munch with.